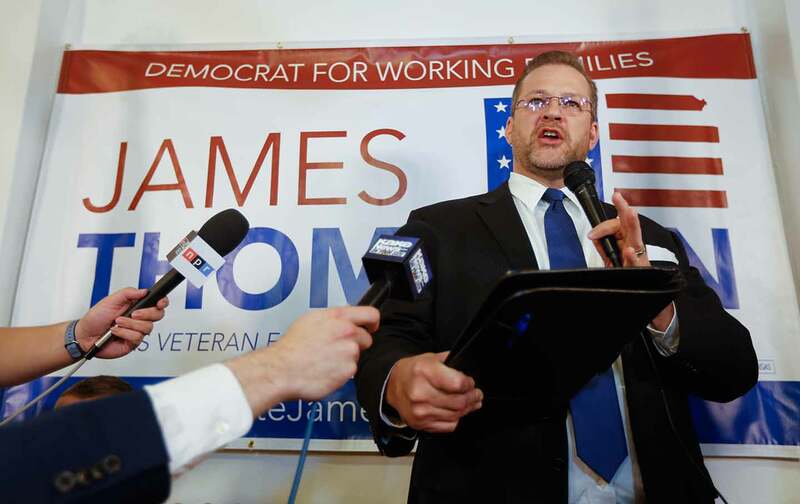 The DCCC barely lifted a finger to help James Thompson. He almost won anyway. The party had a chance to score a game-changing victory in Tuesday’s special election by filling the seat that opened up when Donald Trump tapped Republican Congressman Mike Pompeo to head the CIA. It was an outside chance, to be sure. But it was real, and it became more real as election day approached. Unfortunately, national Democrats failed to recognize—or respond sufficiently to—what was happening on the ground. But something was happening—as the results ultimately revealed. Just last year, Pompeo won reelection with 60.7 percent of the vote, as compared with just 29.6 percent for the Democratic candidate. When Pompeo—a Koch-brother acolyte who represented the region where Koch Industries is headquartered—joined the Trump administration, the first post-2016 special election for a House seat was called. Washington Republicans assumed they had the seat locked up, and Washington Democrats generally agreed. Talking-head pundits could barely be bothered to pay attention. But civil-rights lawyer James Thompson was paying attention. Inspired by the 2016 presidential run of Vermont Senator Bernie Sanders, Thompson jumped in the race and ran a smart, progressive populist campaign that—despite his newcomer status and relatively small campaign treasury—resonated with a lot of voters. On Tuesday, Thompson took almost 46 percent of the vote—improving on the Democratic percentage from 2016 by more than 16 points. Where Pompeo regularly won by margins of more than 30 points, Republican Ron Estes won this year by under seven points. Could Thompson have won the seat? Yes. The Kansas contest was always going to be an uphill race. But a combination of history and the unsettled Trump moment held out possibilities from the start. Special elections are strange beasts. They produce upsets, especially when presidents are unpopular—the classic scenario came in 1973 and 1974, when Democratic wins in unexpected corners of the country confirmed just how much trouble a Watergate-plagued Richard Nixon was in. History provides plenty of other examples of special-election upsets—and of the powerful boosts they provide for out-of-power parties—and savvy partisans are well aware of what’s at stake when one-off elections are held at volatile moments. Republicans proved to be savvy as the Kansas election approached. They recognized that Thompson’s old-school economic-populist campaign against Trump and Trumpism (as well as against unpopular Kansas Governor Sam Brownback and the Kansas-based Koch brothers) was closing the gap, and the GOP establishment panicked. House Speaker Paul Ryan sent a last-minute fundraising plea, Vice President Mike Pence recorded phone calls on behalf of the Republican nominee, President Trump tweeted about the race, and Texas Senator Ted Cruz raced to the district on Monday to declare: “Today the eyes of the whole country are upon Kansas.” Most importantly, the National Republican Congressional Committee and GOP allies poured money into media buys and mailings in the final days of the contest. The DCCC made some last-minute calls, and a lot of excuses. There were even those who suggested that the strategy was to “fly under radar”—apparently missing the fact that Republican radar detected what was happening and mobilized at precisely the point when Democrats could have and should have moved money and attention to the race. That’s also precisely what top Democrats need to hear. The party is in transition; it has a new chairman, and there are certainly key players in Congress who know that the same old strategies will not work in a moment when resistance energy can be turned into electoral power. The party has tremendous potential in 2017 and 2018 to reverse the losses of the past few years, and to check and balance Trump and Trumpism. But this is the point where potential has to be realized. DC Democrats talk a good game about a 50-state strategy. But they still do not have one. And this failure of focus and will is costing the party contests that it could be winning.